Only 2 more sleeps until you will be able to order from the new Stampin' Up! Holiday catalogue! The catalogue goes live on September 1st. 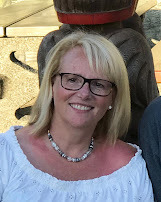 I know you are going to love the new products as much as I do. As a demonstrator we get a chance to see the catalogue and to order from it early - that way we can have some samples made to show you. 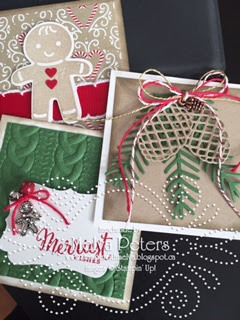 There are so many amazing new products but I'm particularly in love with two (it was hard to narrow it to two) - The Candy Cane Christmas Suite and Christmas Pines stamp set and coordinating framelits. I just love Real Red, Crumb Cake and White together and this suite is all about that with some very cute stamps and sentiments. 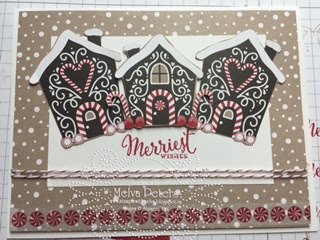 The Candy Cane Lane Designer Series Paper is adorable with images that are large enough to cut out and use on cards or you can use the paper as a background. Here's a card I shared before - CASE'd (copy and share everything) from the Holiday Catalogue on page 4. This was so easy to make - just a little bit of fussy cutting to cut the houses out of the Designer Series Paper! I love the detail of the pine cones in the stamp set and coordinating framelits. Here's a square that I have used in the Collage I've made for an upcoming class. It's hard to see, but I stamped the pine cones first and then cut them out using the framelits. I also cut out some bows for greenery. Add a bow and little pine cone embellishment (also available in the catalogue) and you're done! I'll be holding a class where we'll make a collage that uses a bunch of products from the new catalogue - you can see some of those above - Cable Knit embossing folder, Cookie Cutter stamp set and punch, beautiful ribbon and twines. The collage includes 9 3x3" squares on a 12x12" background perfect for framing or giving away. The class will be held on Sunday, September 25th from 1-3pm. The cost is $25. Email me if you are interested in signing up. If you haven't received your catalogue yet, please email me. I'd be happy to get one to you if you. If you have been meaning to order the Thoughtful Branches bundle, don't delay. 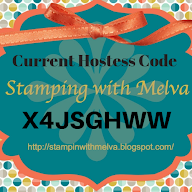 This is only available while supplies last - Stampin' Up! is not going to carry this set after that! Don't miss out if you had your heart set on this set!